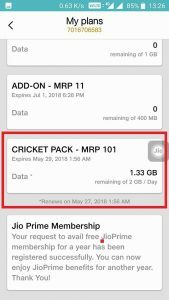 Jio Cricket Gold Pass: Get 2GB Internet Data Per Day for 51 Days at Rs 251 Only!! – Ipl 2018 Season is Back and Jio is in full mood of making it the best events in India. Jio has brought a new Pass named Jio Cricket Gold Pass under which it offers many cool things such as All IPL Matches Live Streaming, Play Along with Every Match to Win Prizes, Watch Cricket-Comedy and Other Cool Plans absolutely Free. Jio Rs 251 Plan which offers 102 GB 4G High-Speed Internet Data for 51 Days is the Part of the Jio Cricket Gold Pass Benefits. If you are live streaming IPL Matches or any other shows then obviously it uses much internet data. So Jio has considered this and came-up with Jio Rs 251 Plan which gives access to 2GB High-Speed Internet Per Day. This plan best suits all the IPL Cricket Lovers. Step 1: First of all, initiate a Recharge of Rs 251 on your Jio Number using MyJio App or Jio.com Website. You also recharge from any other App like Paytm, PhonePe or FreeCharge and also avail any on-going Jio Recharge Offers. Step 2: Once you recharge with Rs 251 then the Jio IPL Plan will be activated with the benefits listed above. Step 3: You can now enjoy all the benefits of Jio Rs 251 Plan and daily consume 2 GB Data. That’s it. If you loved this Offer then do share it with your friends!! Also, if you find any good Jio Recharge Offers then do comment them below. Thank you!! Husen Memon is CEO of TrickyTime.in who is young Blogger and B.Tech CSE Student from state Gujarat! He Loves Blogging and currently he is Part Time Blogger Blogging at TrickyTime.in and writes regularly on Modern Technology, Gadgets, Learning and Earning Tricks! I already have the 448 Plan running, which ends on 28 April, in which I am getting 1.5GB per Day. If I Recharge Rs. 251/- now, dies it overlap the existing plan or I will get 2GB Extra Data? Or if the Cricket Live Streaming only would be covered by this new plan? Also, please let me know, if this 251 Plan would be sufficient to continue till IPL Season is over, or do I need to recharge after the present plan of 448 ends by the end of this month? Jio Cricket Plan of Rs 251 is like add-on plan if you have any existing plan running. So in your case, you will be able to enjoy total 3.5 GB High-Speed Data per Day until Jio Rs 448 Plan expires. Once it expires, you will get 2 GB Data benefits per day as per Rs 251 Plan. Hope this helps and clears your doubts. Thank you! What about our Live Plan of Jio of Rs.398? Your new plans benefits will be live after the old plan expires. That is a Normal Situation! But my question bus different. Firstly, if I Recharge with 251 now, would the Cricket Live Steaming would be covered under that? Secondly, what about the balance period of the present 448 plan? And the Third question is, do I need to Recharge again on expiry of the present 448 plan?? ?